As part of our formation work at the Newman Center at Boston University, we are looking into a six week series on the New Evangelization by Fr. Robert Barron. While reviewing the materials yesterday, a couple of things really jumped out at me. The first was the term, "Beige Catholicism." This is how Fr. Barron describes the type of Catholicism that many of us were exposed to over several decades. It is, what I would call, a "safe Catholicism." It is the bland milquetoast approach to Catholicism that has been the hallmark of so many programs, parishes, schools, and institutions in the life of the Church. It is the type of Catholicism that shies away from any sort of notion that following Christ demands some sort of decision on my part. It is a Catholicism that is more "Chicken Soup for the Soul," than it is, "Take up your Cross and follow me." When I read the term, "Beige Catholicism," I thought, "Yes, that's it!" When Pope John Paul II urged the young people of the Church towards the New Evangelization, he met with a lot of opposition from those entrenched in the "Beige Catholicism." 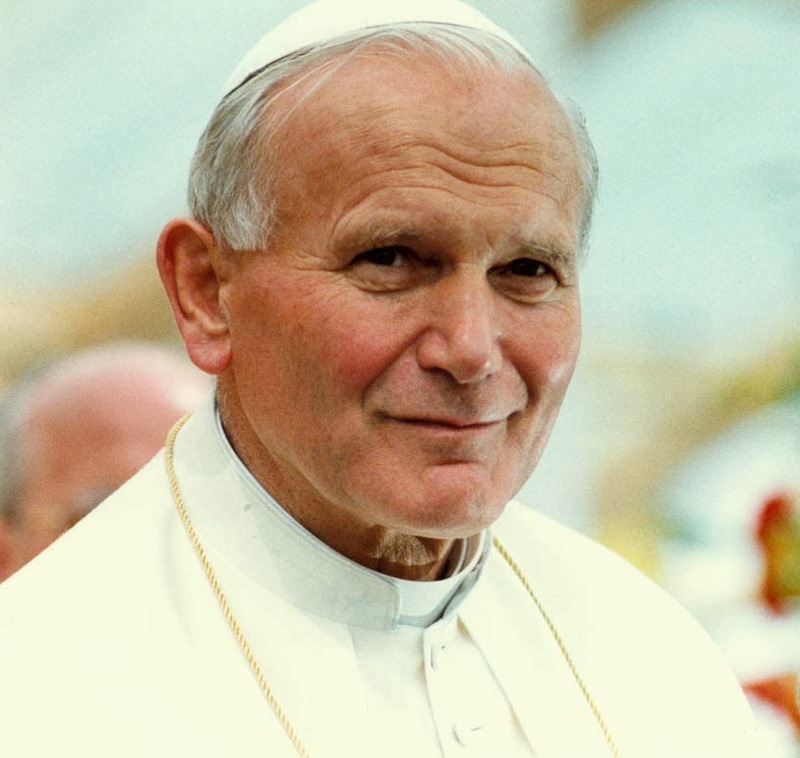 John Paul II called young people to make a decision for Christ. He called them to follow Christ despite the opposition that they would encounter. Ten years ago, the words, "New Evangelization," were considered a conservative plot. If you uttered the words, "New Evangelization" ten years ago, you could be certain that the ideological machines would be moving against you. Today, there remains some effort to co-opt the New Evangelization and to turn it merely into an advertising campaign. This was the second thing that struck me about Fr. Barron's materials on the New Evangelization. In the DVD series, a woman from Australia says that if you approach the New Evangelization simply as a marketing tool to make parishes grow, you are setting out on the course of failure. The New Evangelization is about people encountering Christ and being transformed by that encounter. It is a decisive evangelization. Even today, many of those who exercise positions of influence in the life of the Church are seeking to reduce the New Evangelization to a lukewarm, milquetoast beige kind of Catholicism. The alternative to "Beige Catholicism" is not "Nasty Catholicism." The alternative is "Joyful Catholicism." It is a Catholicism that I witness in the life of the young men and women whom I serve at the Newman Center at Boston University. They are thoroughly normal, well-adjusted, humorous, and intellectually astute young men and women. They are also devout. They love the Eucharist and the Sacraments. They love to share the joy of the Gospel with others. They are characters. Beige Catholicism, I think, tries to to destroy character. Beige Catholicism tries to suffocate characters. In the "Beige" worldview, Charismatics are too charismatic, Opus Dei is too conservative, the Neocatechumenal Way is too controlling, Communion and Liberation is too political, and those attached to the Latin Mass need to be reigned in. Beige Catholicism likes to talk about "diversity," but seeks to squelch any signs of true and authentic diversity. How did this all come to mind today? It's difficult to describe. This morning, I heard the confessions of college students and then had Mass with about twenty-five of them. In the afternoon, I hung out with students and had beautiful conversations about dating, marriage, priesthood, practical jokes, YouTube videos, the Sacraments, music, and all sorts of other things. They made fun of me. I definitely made fun of them. And in the midst of all of this, I thought, "This isn't beige." This is the joy of Catholicism. Catholicism is a friendship in Christ. The New Evangelization is NOT about making the Catholic Church bigger. The New Evangelization is about encountering Christ and being moved by joy to be servants of that encounter for others. There are always those who seek to impose programs as the path to evangelization. This path always leads the Church to a more bland color of beige. True Evangelization is personal and is the result of a true encounter. True evangelization arises from the friendship of the Church. This friendship can never be imposed or mandated. This friendship is a gift that is received and lived with joy. Today, I was evangelized because I lived the friendship of the Church with others. The other day Pope Francis delivered a homily wherein he reflected on the animosity that existed between Saul and David. The scripture passage recounted how David--although he had opportunity to kill Saul--instead showed restraint, humility, and mercy. Remember, Saul was intent upon killing David, so this was David's opportunity not only to kill his enemy, but also to secure his own safety. Pope Francis went on to say that in life there are many times when in our life situation, the plates and pans might let loose, but that eventually we have to build bridges. Otherwise, he says, great walls are built within our hearts, walls that lead to rancor and hatred. Instead, he says though not easy to do, the path to peace is through acts of humiliation. David could have won. Instead, he made peace through restraint and humility. So often when Pope Francis is spoken about, people talk about "where he is leading the Church." People talk about how--whether they like what he says or not--he is "changing the Church." These words always seem too remote for me, too distant from my life. Such commentaries often sound like the "Church" that Pope Francis is trying to change exists apart from the individual commentator. In other words, the commentators seem to position themselves simply as observers standing outside of "the Church," that needs to be changed. For me, I read Pope Francis and his words make me uncomfortable. When I listen to him, what most strikes me is that his words are challenging me to change. For my life, while changes in Vatican Dicasteries, the limiting of making monsignors, or the overhaul of the Vatican Bank, might be of some interest, those changes do not affect my life greatly. But, the preaching of the Gospel does change my life. For me, the most significant change that Pope Francis has called for is not taking place in some bureaucratic structure. The most significant change is in my heart. This is the power of the Gospel. The transformation of my heart is what is needed. I don't want to be an objective observer of ecclesiastical overhauls. I need to be a subjective participant in my own conversion. As a preacher, I've always cringed when somebody coming out of Mass has said, "Father, you really told those people what they needed to hear." To me, that sounds like an objective observer. It says that I didn't touch that individual heart. Similarly what an amazing joy it is when somebody tells you after a homily, "Father, that is exactly what I needed to hear today." 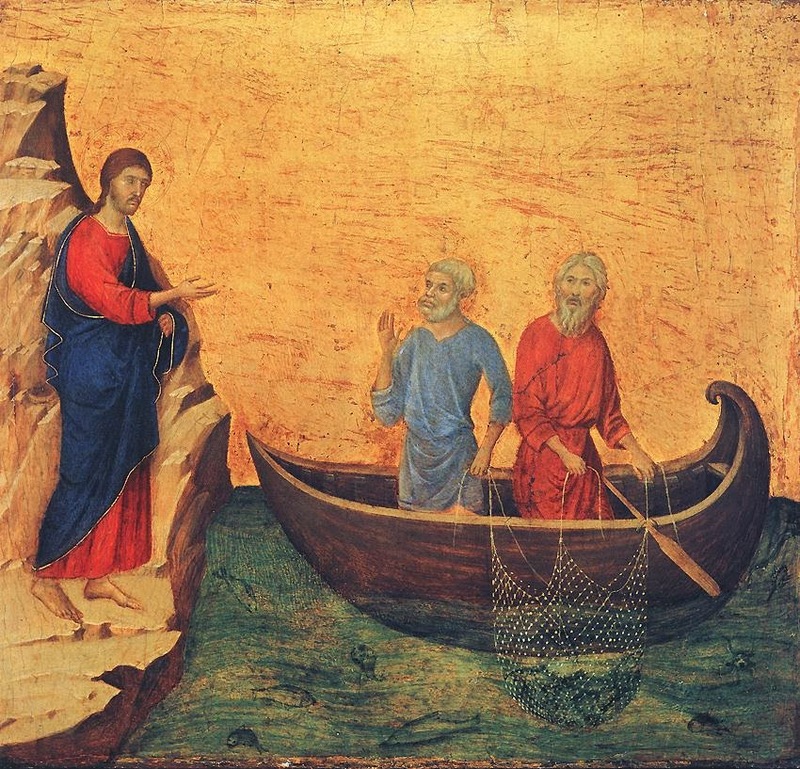 Today, on the Third Sunday in Ordinary Time, the Gospel recounts the calling of Peter and Andrew and James and John. They were called in pairs. In some way, does this not show a solidarity in their callings? In other words, though each man had to respond personally to the Lord's invitation, each man's vocation was intimately connected to that of the other. They were not mere observers of the other. They were bound together in a mysterious and awesome communion. Today, St. Paul warns the Corinthians not to have rivalries or divisions among them. In Paul's day, the divisions were: "I belong to Paul," "I belong to Cephas," or "I belong to "Apollos." Today's divisions might be, "I belong to Benedict XVI" or "I belong to Francis." These divisions might also be on a far more local level. Disagreements in parishes, dioceses and presbyterates will always be a reality. But, disagreements ought not to become walls that divide. We are all like Peter and Andrew and James and John. Our life in Christ is intensely personal. But, it is also intimately linked to the lives of our brothers and sisters. In Christ, we are one. This unity is something given by Christ and originates in Christ's own unity in the Blessed Trinity. Our unity with the Trinity was won through the humiliation of the Cross. A newspaper once asked various authors to write essays on the topic, "What is wrong with the world?" Among those chosen to write an essay was G.K. Chesterton. His essay was the briefest of all those submitted. To the question, "What is wrong with the world?" Chesterton replied, "Dear Sirs, I am." Similarly, perhaps instead of focusing on how Pope Francis is "trying to change the Church," we ought to remember that the Word he preaches is meant to penetrate my heart and change it. Of course, this requires humility on our part. It requires us to remember that even those with whom we disagree were also called by Christ. It requires us to seek unity in the Church by an unlikely path. Our first inclination is seeking unity through making the others change (and the others probably do need to change). But, Jesus shows us another way. When our unity with God was lost through our disobedience, Jesus led us back to God through the path of humility. He led us back to God by humbling himself and taking on our disfigurement. To paraphrase G.K. Chesterton: "What is the most important thing that Pope Francis is trying to change in the Church? My heart." I spend every day with young college students who are great witnesses to the joy of the Gospel. 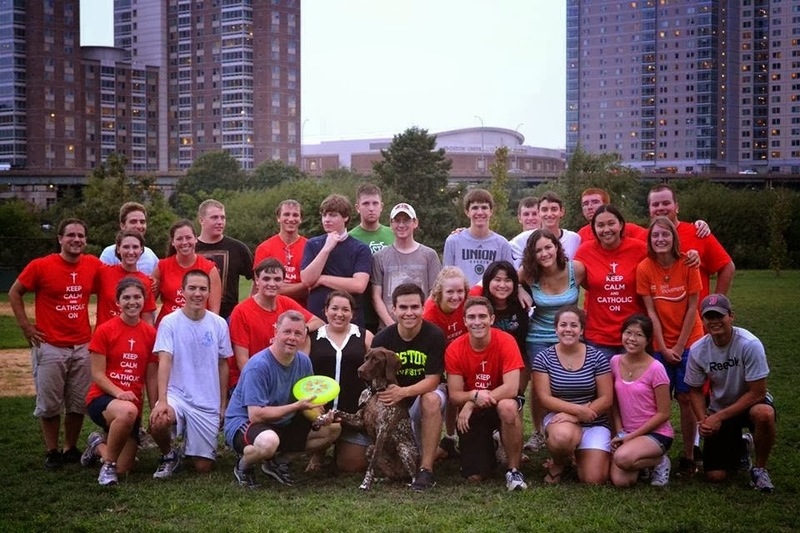 Located in the heart of the Boston University Campus, the Catholic Center is an amazing place. The Catholic Center at Boston University is responsible for funding itself. Although Boston University is very hospitable to us and we maintain a very good relationship with the University, we are not funded through the University. This means that we depend upon the donations of our alumni, parents, students, and friends. Asking for money is never easy and always makes me feel a bit like I'm asking people to give ME their money. But, in order to have a Campus Ministry program to make the sacraments available to the students at BU, to have a place where students can come and form good Christian friendships, and a place where they can grow in their knowledge and love of Jesus Christ, part of my responsibility is to raise money. Tonight, about thirty students gathered in our Catholic Center in order to receive training for our primary fundraiser of the year, which happens this weekend. It is the annual "Phonathon." Our kids will call thousands of people in order to raise money to keep the Catholic Center funded and strong. As I looked around the room tonight, I was really touched by the dedication, intelligence, and faith of these students. I'd like you to consider donating to the BU Catholic Center. Let me try to make my case to you. Without hesitation, I can tell you that the money that comes into the BU Catholic Center is an amazing investment in the Gospel. These young people are amazing. Our Newman Center is a place of beautiful friendships in Christ. What happens at the Catholic Center? Three Sunday Masses (the last being at 10pm), daily Mass, daily confessions, retreats, service projects, meals, twenty on-campus bible studies, mission trips, continuous evangelization efforts around campus, clothing drives for the poor, adoration four days a week, formation evenings, men's and women's groups, social events, and young people finding a home away from home in a Catholic setting. In the past decade, numerous students from the BU Catholic Center have entered the seminary. These young people not only support one another in living the Catholic life, but they are constantly trying to bring the joy of the Gospel to others. There's not bitterness, ideology, or agenda with these kids. They love Jesus, the Sacraments, and the Church. They look at the world around them and have an ardent desire to announce the joy of the Gospel to others. I told the young people tonight that I'm surprised that a place like the BU Catholic Center doesn't have some really big donors! What happened to all of those graduates who went on to great careers?? If, by chance, you are one of them and you stumble upon this blog, please get in touch with me!! But, more than likely, the few readers of this blog are mostly people who may be able to make some modest contribution to the Catholic Center. Modest is good! Please consider it. I am always nervous about putting my name to a request for money. I want to make certain that if my name is on the request, I can stand by it. I promise you that I stand by the BU Catholic Center. Something awesome has been going on in this place. This place isn't talking about the New Evangelization. This place is the New Evangelization. Please consider being a part of it. You can also donate through ParishPay--an online giving program. Go to www.parishpay.com and type in "Boston University Catholic Center." Breaking Bad and John the Baptist, Yo! During the past few weeks, I've found myself hooked on "Breaking Bad." I've watched several seasons worth of episodes and can't seem to get enough of this show. For those who do not know of the show, I can assure you that there is nothing really redeeming about the program. In a nutshell, the show is about a high school chemistry teacher who is diagnosed with terminal cancer. In order to provide for his family before he dies, he and a former student of his, begin to cook Meth and to be drug dealers. The show came to mind as I thought about today's Gospel. Everyone in that show wants to be happy. They desperately want to be happy. But, they're all miserable. And in every episode, they become more miserable. There are occasionally moments when some semblance of happiness looks possible, but it is fleeting and the character descends to a deeper level of misery. The show is filled with overdoses, murders, embezzlement, power struggles, adultery, rage, betrayals, and deceit. They all want to be happy, and the paths that they travel to get there are all dead ends. They are what the spiritual tradition has called, "The Deadly Sins:" Pride, Anger, Lust, Envy, Gluttony, Avarice, and Sloth. They don't do these things in order to be miserable, but because they think that these paths will make them happy. They don't know how to be happy, but they want to be happy. Today, in the Gospel, John the Baptist stands surrounded by the crowds. The crowds who came to see John were there because they too wanted to be happy. They were looking to John the Baptist for an answer. What the people discover in John the Baptist is not a man who holds out his hands and says, "Here I am. I will make you happy." He doesn't propose some new idea or some new gimmick for happiness. He doesn't start a website that promises to help you find the person who will make you happy. He doesn't offer a new drug, a path to self-improvement, or money. 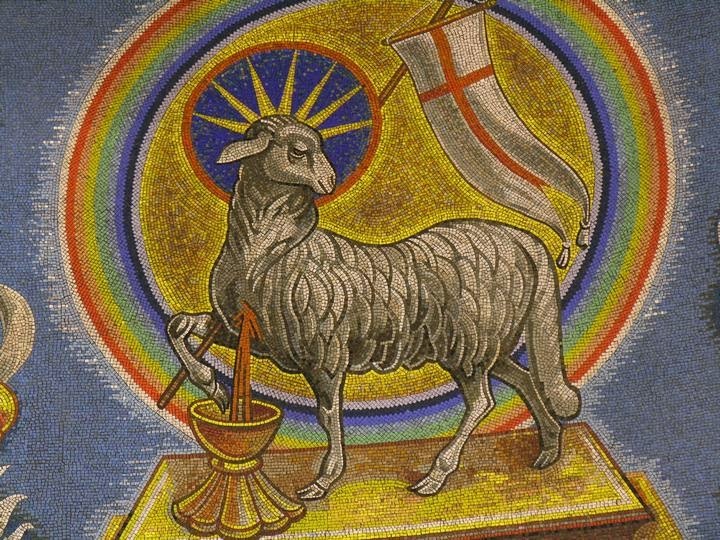 Instead, as all eyes were fixed on John, he raises his hand and points to Christ: "Behold, the Lamb of God who takes away the sins of the world." John does something entirely new. He points to the presence of Christ and says, "That man is where you will find happiness." It's a pretty cool thing that for the past two thousand years, thousands of times a day all over the earth, the words of John the Baptist are quoted, "Behold the Lamb of God. Behold him who takes away the sins of the world." This is the whole mission of the Church. The Church points to Christ and testifies to Him. The people that we encounter every day want to be happy. Nobody wakes up in the morning and says, "I'd like to be miserable today." Everyone wants to be happy. But, like "Breaking Bad," so many folks only know the seven dead ends--Pride, Envy, Lust, Gluttony, Sloth, Anger, and Avarice. Even those of us who have encountered Christ are sometimes convinced that the Dead Ends might lead us to happiness. Whether we have met Christ or not, we all need witnesses. We need to see people who have been changed by the encounter with Christ, people who are truly happy. We need to see happiness not just in theory but in reality. We are called to be like John the Baptist and to bear witness to Christ by pointing towards him. If we do not point to Christ--by the testimony of our words and our life--then we leave others only with the Seven Dead Ends. Convinced ourselves of Christ's love, we have the possibility of offering to others a way out of their misery. Sometimes, we hinder our own efforts at evangelization by sounding like we are just promoting our own ideas, morality, and opinions. Today, John the Baptist invites us simply to point to Jesus Christ, the Lamb whose Blood gives true life and lasting happiness. He is what we are all looking for. He is the Lamb of God who takes away the sins of the world. Happy are those who are called to the supper of the Lamb. A few weeks ago, you all left for a well-earned semester break. I hope that it was good and restful. I enjoyed a week away in some warm Florida weather. I'm trying to figure out a way to convince Boston University to have all of us do every second semester abroad in a warm climate so we can all be together and warm. So far, the exact proposal is escaping me, but I will continue to work on it. In the meantime, I'm writing you this letter now--before you actually have course work to read--in the hopes that you might actually read this! Although I began work in June, I only met most of you at the beginning of September. Since that time, I hope that it is entirely obvious to you that I have a great affection for you. I admire you for your fidelity to Christ, your love for the Gospel and for the Sacraments, and for your evangelical joy and courage. I see in you what Blessed John Paul II always saw in the young people of the Church. It is no coincidence that you chose him to be your patron for this school year. In you, I see a mature zeal for the Lord. It is a great grace as a priest to be among young people who love the Eucharist, frequent the Sacrament of Penance, pray so sincerely and beautifully, and who desire to draw others toward the Love of Christ. You've surprised me. One might expect that such young people would be carried away with ideology or to be given over to a lot of soap opera like drama! Instead, you've been dedicated to growing in personal holiness and joyfully evangelizing others. I'm really moved by the way that you evangelize. You're out there. You're inviting others, praying for others, and witnessing to others. And, the friendship that we are living together at the Catholic Center provides to all who step into our home the beauty of the attraction of Christ. It is something truly beautiful. As we begin second semester, it could be tempting to settle into a sense of complacency. "Who we've got, we've got." But, let's be compelled by the love of Christ! You have something beautiful! Don't be afraid to share it with others. We are on a big campus and there are thousands of people your age who are hungering to encounter what you've encountered. You are the missionaries of Christ. As our new semester together begins, I look forward to being with you. Remember, there are confessions available every day from 11:45-12:15, followed by Mass at 12:30. Don't forget to invite others to Confession and Mass. Share with them the joy you experience in these sacraments. In addition to our Monday night Adoration and Benediction, we will also have adoration on Wednesday afternoons. Invite a friend. Or, use that time in adoration to pray for a friend. And, of course, on Tuesday Nights, we have our weekly formation night. I cannot begin to tell you how grateful I am for the team that I inherited here at the Catholic Center. Fran, Camille, Bobby, Danny, John, Jenn, Gina, Wesley, and the whole Pastoral Board have been awesome. So have all of you. We are all in this together. Let's make the second semester even more evangelical than the first semester! Let's live these days together as men and women who are involved in the most important mission that has ever been given. Because that's exactly who we are. I look forward to seeing you in a couple of days and to going on mission with you. One of the ancient titles for priests is "pontifex," which means "bridge-builder." This bridge building happens in a host of ways. By sharing in the priesthood of Jesus Christ, the priest is instrumental in building the bridge between God and man. He does this especially through the sacramental life of the Church. He also is instrumental in building bridges between a specific community and the local and universal Church. (Think of how he prays for the local bishop and the pope at every Mass). He is instrumental in building bridges between the Church on earth with the Church in Heaven and in Purgatory. (Think of how at every Mass he mentions the saints and the dead.). But, he also is instrumental in building bridges among the members of the local Church. Because the University is on vacation, there was no Mass at the chapel today. But one of the students who has arrived back to school early met me and we had Mass together. It was great to offer Mass together. After Mass, I invited him to come with me to a hospice where I had to anoint and offer prayers of final commendation for a man I have known since my childhood. The young man joyfully accepted the invitation. The dying man was almost entirely unconscious. The young man and I prayed for him and I anointed him. Bridges were being built. Through the prayers of anointing, the man in his final agony was being more firmly inserted into the Paschal Mystery. 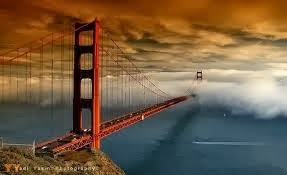 He was being united to Christ who is the definitive bridge between God and man. In the Litany of the Saints, a bridge was being built between that dying man here on earth and all of the saints in heaven. In the Final Commendation, a bridge was being built between the mercy of God and this man's entire life. But, there was also another bridge being built. A bridge was built between the young man and the dying man. Among the most beautiful things in my life as a priest has been the privilege of being an instrument of communion among the people. I have the privilege of meeting some extraordinary people and I have the privilege of seeing their beautiful witness to the Gospel. I always consider it an extraordinary grace when I am able to be an instrument that brings such awesome witnesses together. Whenever I read a good book, I want to introduce others to that good book. Whenever I see a good movie, I want to introduce others to that movie. Whenever I encounter the friendship of Christ in the persons whom God places in my path, I want others to encounter them as well. Today, through the gift of the priesthood, a new bridge was built between two men who never met before. The young man prayed for the old man and helped him as he prepares to pass beyond our sight into eternal life. I have no doubt that the older man will repay him. He will soon stand at the other end of the bridge and will pray for that young man as he makes his pilgrim journey to Eternal Life. Among the greatest joys of being a priest is the joy of building bridges. There's a great scene in the movie, "The Untouchables" where Kevin Costner and Sean Connery meet in a church to discuss whether they will team up to take on Al Capone. "What are you prepared to do?" asks Sean Connery. Costner replies, "Anything within the law." "And then what are you prepared to do?" responds Connery. He goes on to say, "You wanna know how to get Capone? They pull a knife, you pull a gun. He sends one of yours to the hospital, you send one of his to the morgue. That's the Chicago way!" You can watch the scene HERE. Believe it or not, this scene came to mind recently as I was thinking about life in the Church. Sometimes, we treat each other as though we weren't brothers and sisters in Christ. There are priests and bishops who purposefully say and do things only to upset people. Why do this? They are not saying these things or doing these things in order to help people grow in their faith. They just seem to enjoy stirring up controversy. On the other hand, there are people who are looking for every opportunity to jump all over their priests and bishops. They are on the hunt for heresy or for some infraction of some small disciplinary matter. Within minutes of something happening in a parish, a blogger from the other side of the country is rallying the troops. It happens among the clergy as well. It can be all very political and unseemly. One group attempting to knock another group out of power. Ideologues demonizing one another in a struggle for power. Today, Pope Francis gave a homily on priesthood and he warned priests to make certain that they maintain a strong relationship with Jesus. He said that priests are anointed, but if they lose their relationship with Jesus, instead of being anointed, they become "smarmy." He said that smarmy priests are terrible for the Church. I read that and I thought, "I don't want to be a smarmy priest!" Then I started wondering, "Am I a smarmy priest?" I can see how it happens. It happens "The Chicago Way." It happens when we begin to look at others not as brothers and sisters in Christ, but as an enemy to be destroyed. It happens when our focus is too much on other things and not enough on Jesus. There's too much "Chicago Way" in the life of the Church these days. And, that "Chicago Way" isn't going to win people to Christ. We sometimes become outraged when we see a smarmy priest or bishop exercising his power to advance a bad agenda or to advance himself. The temptation might be for us to try to outdo him in smarminess. But, this is a fool's errand. Unfortunately, we sometimes are all too ready to become the smarmy fool in the name of a good cause! Smarminess, the Pope reminds us, is not the answer. Smarminess is the problem. What then is the answer? In the face of the smarmy, we have to return to the face of the Anointed One. We have to return to Jesus Christ. The smarmy are self-reliant. This will ultimately be their downfall. The anointed are Christ-reliant and this will be their victory. Before we too easily allow ourselves to be dragged into controversies and into the "Chicago Way," let's be sure that we are spending lots of time with Jesus. It's better to lose and be close to Jesus than it is to win and be smarmy. There's too much smarminess and "Chicago Way" in the life of the Church. It is often instigated and fed by the media and the Internet. 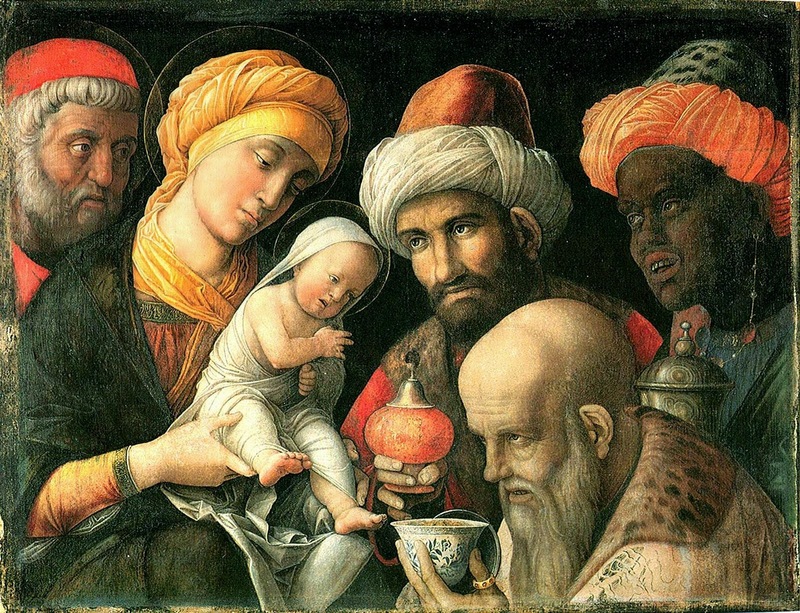 The best thing we can do to turn it around is to be like the three kings. Instead of going back to Herod and fighting him on his turf, they just went home a different way. Our different way should be the same as theirs: It begins with adoring Christ. Although the Christmas decorations are long gone for most of the secular culture, the Church squeezes in a few more days of Christmas. It is interesting to see the readings provided to us during these last days before the Feast of the Baptism of The Lord. Yesterday, for instance, we heard from St. Mark's Gospel on the miracle of the multiplication of the loaves and fish. The people present that day came from all sorts of experiences. They were all different. But, they were all hungry. Hunger is a need that is manifested across all cultures, times, and personalities. They were all hungry and Jesus fed them. hungering to be loved. This is the profound hunger of our souls. We want to be loved entirely, completely, and endlessly. Every person we meet has this desire. I have this desire. On Christmas Day, the Church commemorates the profound truth that God's love became incarnate and made his dwelling among us. But, in "stretching out" the Christmas Season and including this Gospel in it, the Church is teaching us that this love was not for just a moment. It was not just for a few shepherds and some kings. Jesus feeds the five thousand on that day because he knows they are hungry. But it does not end there. St. Mark informs us that there were twelve wicker baskets leftover. This "twelve" symbolizes the Church. 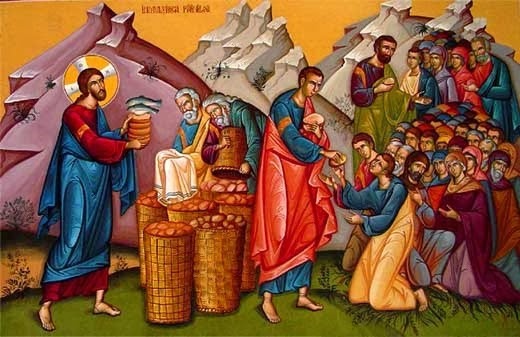 Today, the Church continues to draw from these twelve wicker baskets the infinite love of God and she feeds all who are hungry. We have the opportunity every day to feed those who are starving for love. When people meet us, they ought to be fed from the wicker baskets. This is evangelization. Evangelization is to feed others with the love of God. The Church can risk becoming stingy with this love, distributing it sparingly. We do this when our love is preceded by certain conditions that must be met. No, we must love first. The Church can also risk becoming too self-absorbed in its evangelization. The focus can become too much on planning and upon making ourselves successful, and too little about depending upon the twelve wicker baskets. Two fish and five loaves was a terrible plan! So was making the spread of the Gospel dependent upon twelve very human men. I freely admit that I might be wrong. But, I fear that we have adopted the language of corporations at the expense of the language of the Gospel. In my experience--especially as a pastor--I have found that the expertise of business people in the life of the Church is of inestimable value. But this expertise needs a priest to translate this into pastoral practice. And, the first people who see the truth of this are the faithful business people. While the People of God get upset when their ecclesial leaders do not adopt sound business practices, they are even more upset when the clergy try to sound like little CFO's. Sure, clergy should do their best to understand and implement sound financial practices. But, the people--and especially the business people who give their time and talent--really want their priest to be a priest. They want their parish to be a parish. They want their children to know the joy of feasting on God's love; a love discovered from the superabundance of the twelve wicker baskets. marvel at how God's love really does feed the hunger of the sheep. What builds awesome parishes and dioceses is not primarily the result of human ingenuity. It is true that Jesus ordered the disciples to do some planning. They had to find out how much food there was. They also had to organize people and to distribute the food to them after it had been multiplied. But, the key is the action of Christ. No corporate planner would say, "Hey, let's try to take five loaves and two fish and feed five thousand people." Those corporate officers would and should be fired. Perhaps in the life of many dioceses, sound corporate practices were not heeded. This is a shame. But, the proper evangelical response to this is not to adopt a language and a mentality that is foreign to the Church. The proper response is to adopt sound corporate principles that are shaped by and obedient to sound theology. else wants that too. I'm not dismissing the whole notion of planning or suggesting that it is a bad thing. In actuality, I think it is a good thing. But, I am suggesting that our pastoral planning--while always taking into account the wonderful expertise of the corporate world (an expertise that I have always relied upon)--must always originate and remain faithful to a miracle that we cannot create: two fish and five loaves fed five thousand men. This is the miracle of the Love of God. Everything depends upon twelve wicker baskets.